Matcha green tea is used in the Japanese tea ceremony. The tender, shade-grown leaves, known as tencha, are stone-ground to a fine powder (here’s a kit to make your own). Whisked into a bowl of hot water, it produces a bright, grassy brew. 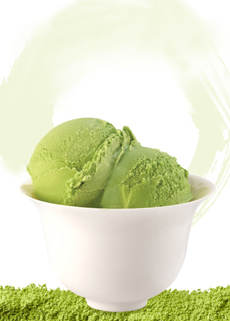 But Americans are more familiar with green tea ice cream is made with matcha tea, one of the finest Japanese teas. It’s not just delicious: It’s full of antioxidants. Matcha delivers much more of them: 1385 ORAC units per gram, compared to 253 for goji berries, 105 for pomegranate, 93 for wild blueberries and 60 for açaí (details). 1. Soften a pint of high-quality vanilla ice cream until it is malleable. 2. Place the ice cream in a large mixing bowl. Stir in two tablespoons of matcha tea and blend well with a large spoon. 3. Cover the bowl with plastic wrap or refill the carton. 4. Return to the freezer and chill until set. Mmm: matcha ice cream. Photo courtesy Republic Of Tea. Lattes & Smoothies. For a latte, add one-third of a teaspoon to heated or steamed milk, and sweeten to taste. 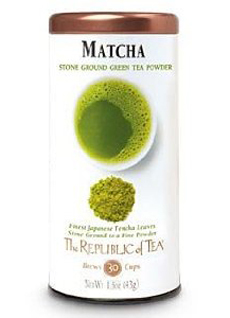 For a smoothie, add 1 teaspoon of matcha into a cup with a bit of hot water, to make a paste. Add the paste to the other ingredients. Baked Goods. Mix a tablespoon of matcha into pound cake and yellow cupcake recipes. Citrus highlights, such as a tablespoon or two of lemon juice/zest or yuzu juice, pair well with matcha. Creamy foods. Mix into crème brûlée, sprinkle on yogurt, add to mayonnaise for seafood salads. Color. Add matcha to light-color purées, sauces and soups to brighten the color and add flavor. We like it in parsnip purées. Add it right before you purée. Oatmeal. Add 1-2 teaspoons to 1 cup oats, before cooking. Finishing Salt. Mix 2:1 sea salt and matcha to add a finishing touch to savory dishes and vegetables. We like it with asparagus and also with hard-cooked eggs. Spice Rub. Add to a spice rub for grilled meats and poultry (especially duck). Ice Cubes. Make matcha ice cubes from cold or room temperature matcha tea. Use them in cocktails, lemonade, sparkling water and to keep iced matcha tea from diluting. Matcha tea is expensive, but worth it if you love the flavor of green tea. According to MatchaSource.com, Japanese tea, in general, tends to be more expensive than teas produced in other countries. It’s the rule of supply and demand: Japan is a small country (think of how much agricultural land there is in China and India, by comparison). The country only exports about one percent of its teas. Production is also more expensive. Only the youngest, sweetest leaves are used. Covering the fields with bamboo mats (tarps) to create the shade-grown tea weakens the tea plants, and a longer recovery period is needed before they can be harvested again. And at the factory, the stone grinders work slowly in order to maintain the nutrients in the tea, including the amino acid, L-theanine, which focuses the brain; ir may help the body’s immune response to infection. Each grinder produces only about 40 grams of matcha in an hour.